JIMPRESSIONS returns for one glorious night! New voices, new stories and new comedy from the master of celebrity voices, Jim Meskimen! 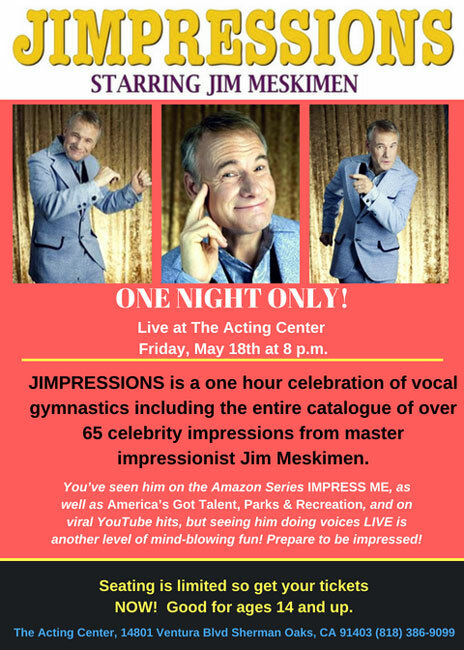 Jimpressions is an evening of celebrity impressions, improv and cultural subversion by actor/comedian Jim Meskimen, the voice of Jibjab.com’s viral hits. You’ve heard him do impressions on Letterman, the Tonight Show, The Boondocks and countless animated shows, now see what happens when he really cuts loose. For advance purchase click the “Buy Tickets” button.